Email received - Dear Herbert (sic), The Los Angeles Philharmonic is hosting an online Enter-To-Win a pair of tickets to the Philharmonia Orchestra concert in May. Would you be able to mention this on your blog for your LA readers? Stacy, I'm delighted to give Walter Legge's old orchestra a plug. But couldn't the Philharmonia have offered your funky West Coast audiences something a little more challenging than the programmes below? Did classical music really end with Mahler? Couldn't they have included some of that gorgeous Xenakis I heard them play in London in March? 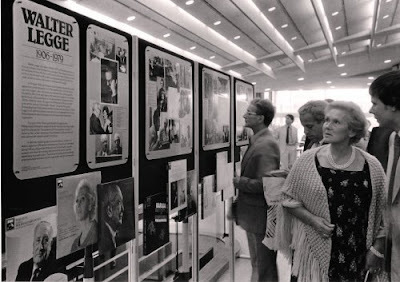 Header photo shows Elizabeth Schwarzkopf viewing the commemorative display I created for the Philharmonia Orchestra's Walter Legge Memorial concerts in June 1979. I am standing alongside Madame Schwarzkopf. More on that story here. Not an adventurous program, but I suspect the conductor has something to do with that...obviously, the LA Phil has been playing plenty of new music in the last few years, esp. under Esa-Pekka.